Now we'll see how to use a little bit of metadata about the images to improve the matching process of i2k PinPoint. The most important information is the ground resolution of the images. First, let's look at how this information is provided, and then we'll discussion the importance of providing relative ground resolution information even when the absolute ground resolution may not be known. Along the way we'll also discuss masking of the images. Let's start with a different set of images, two aerial photographic images taken from different sensors several years apart. 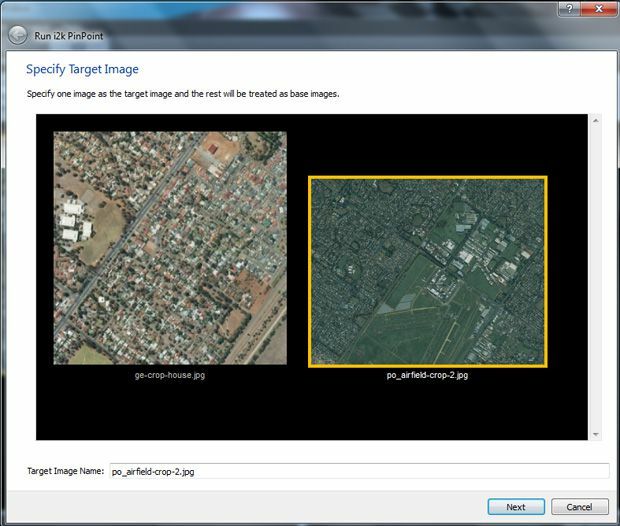 The following screen shot shows the images after we've loaded them and selected the image on the right as the target. Notice that at first it is pretty hard to figure out how the images are related! 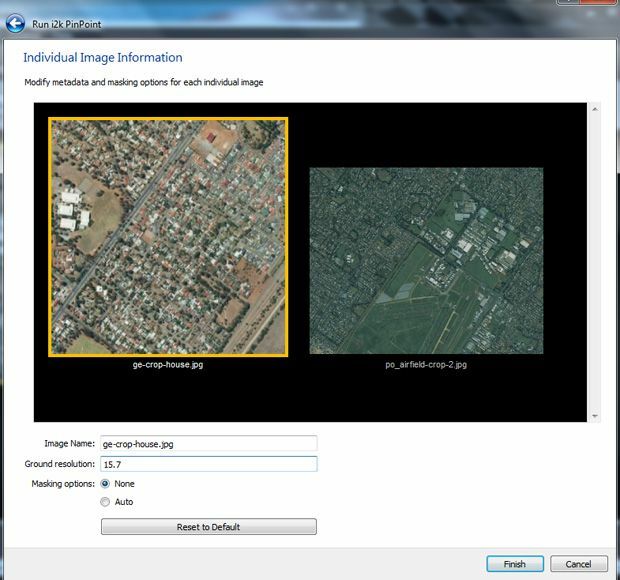 When we click Next, we are brought to the Individual Image Information screen, where we can fill in the ground resolution and the masking options for each image. Here, we have selected the image on the right and typed in 9.5 for the ground resolution. (Note that we have not provided the units here; more about this below.) We have also clicked None under the masking options to indicate that no masking is needed. (If the images had a dark or light band around the exterior that we would like PinPoint to ignore then we would click on Auto instead.) Now, we can click on the image on the left and provide the ground resolution for that image as well. It is important that we do this for all images. Here a bit more information about these "Ground resolution" values. Between the target and the base image(s), the only thing that matters is the relative values of these ground resolutions. If we know nothing about the images, except that a quick look indicates that a pixel in the target image seems to occupy about four times the width on the ground as a pixel does in the base image, then we just specify 4 for the target image and 1 for the base image (in other words, the base image resolution is 4x higher!). Moreover, these numbers could have been 20 and 5, since only their ratio matters. 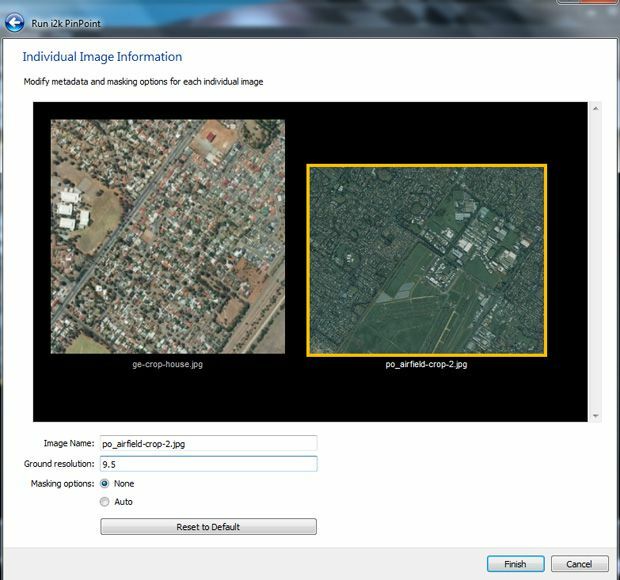 If we don't specify the ground resolutions for all the images we are working with, or if we provide a value that is at or below 0, then PinPoint will ignore the ground resolution information. 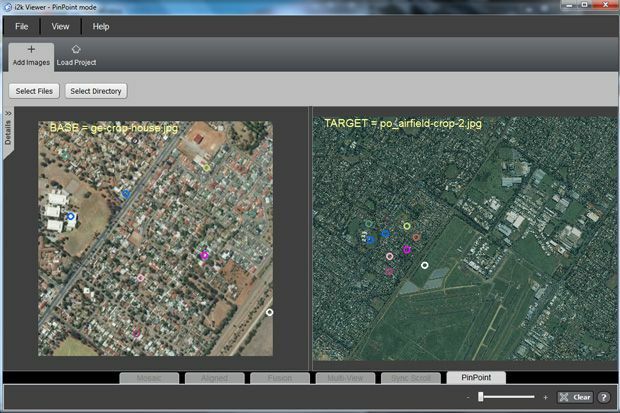 In future versions, i2k PinPoint will automatically extract the ground resolution from image files containing metadata. In many cases, i2k PinPoint works just fine without ground resolution information, which immediately suggests the question of when this is needed at all. If the resolutions of the images are within a factor of two or less of each other, it is rare that the ground resolution is truly needed; i2k PinPoint will work just fine without it. For images having the same modality and similar appearance, the image resolutions usually can differ by a factor of up to three or four before resolutions must be provided. Future versions of i2k PinPoint will continue to increase the allowed difference in resolution. i2k PinPoint does not provide high accuracy correspondences for very large images: For example, when applied to 10K x 10K images, the final accuracies of the correspondences will be on the order of 1-2 pixels, and somewhat more for images of rough terrains.